Whether through your phone or your car or your credit card, caught on a CCTV camera or tracked through your online viewing history, government agencies know where you are, and are quietly collecting your most intimate, mundane, and personal information. Habeas Data shows how the explosive growth of surveillance technology has outpaced our understanding of the ethics, mores, and laws of privacy. 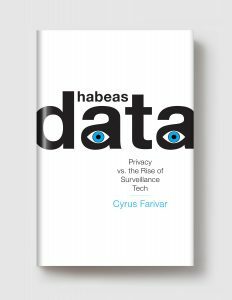 Award-winning tech reporter Cyrus Farivar makes the case by taking ten historic court decisions that defined our privacy rights and matching them against the capabilities of modern technology. It’s an approach that combines the charge of a legal thriller with the shock of the daily headlines. Chapters include: the 1960s prosecution of a bookie that established the “reasonable expectation of privacy” in nonpublic places beyond your home (but how does that ruling apply now, when police can chart your every move and hear your every conversation within your own home — without even having to enter it? ); the 1970s case where the police monitored a lewd caller — the decision of which is now the linchpin of the NSA’s controversial metadata tracking program revealed by Edward Snowden; and a 2010 low-level burglary trial that revealed police had tracked a defendant’s past 12,898 locations before arrest — an invasion of privacy grossly out of proportion to the alleged crime, which showed how authorities are all too willing to take advantage of the ludicrous gap between the slow pace of legal reform and the rapid transformation of technology. A dazzling exposé that journeys from Oakland, California to the halls of the Supreme Court to the back of a squad car, Habeas Data combines deft reportage, deep research, and original interviews to offer an X-ray diagnostic of our current surveillance state. CYRUS FARIVAR is the Senior Business Editor at Ars Technica and the author of The Internet of Elsewhere. He is also a radio producer and has reported for the Canadian Broadcasting Corporation, National Public Radio, Public Radio International, The Economist, Wired, The New York Times, and others.